There are few things in life better than sweet and creamy peanut sauces! All the flavours and textures in this salad, perfect! I guess it’s just the kid in me, but I love food with lots of color! And not the fake, phony additive colors either because I know just how bad that stuff is. Yikes. Love the brussel sprout foundation going on here and the toasted sesame seeds. Those are the best in a salad. 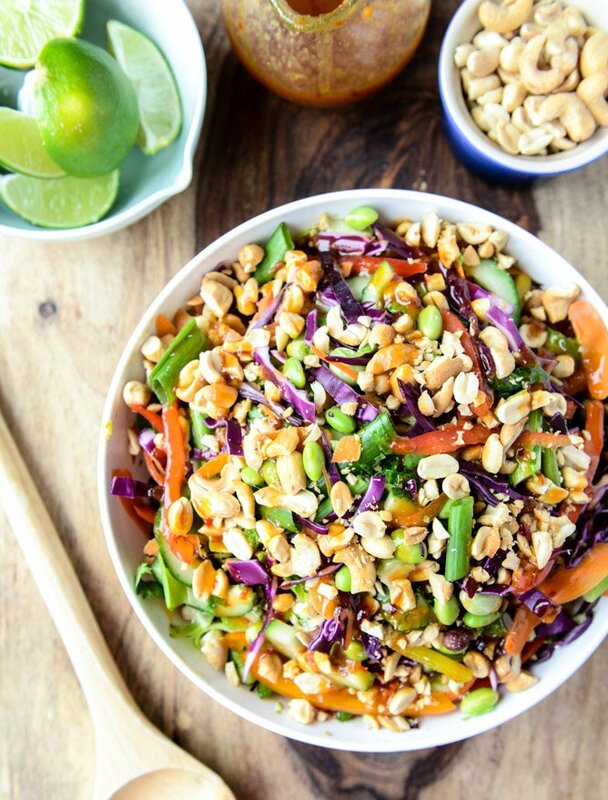 I love everything about this salad, especially the chili lime dressing! Those brightly colored veggies…what a delicious looking rainbow! I love super crunchy veggies, the crunchier the better, so I won’t even have to julienne :) and I adore Brussles, and edamame, mmm, I want this for breakfast! Pinned! The colors in this make me soooo happy. Also, the brussels sprouts. Also, the Thai flavors. Basically, I need this ASAP! 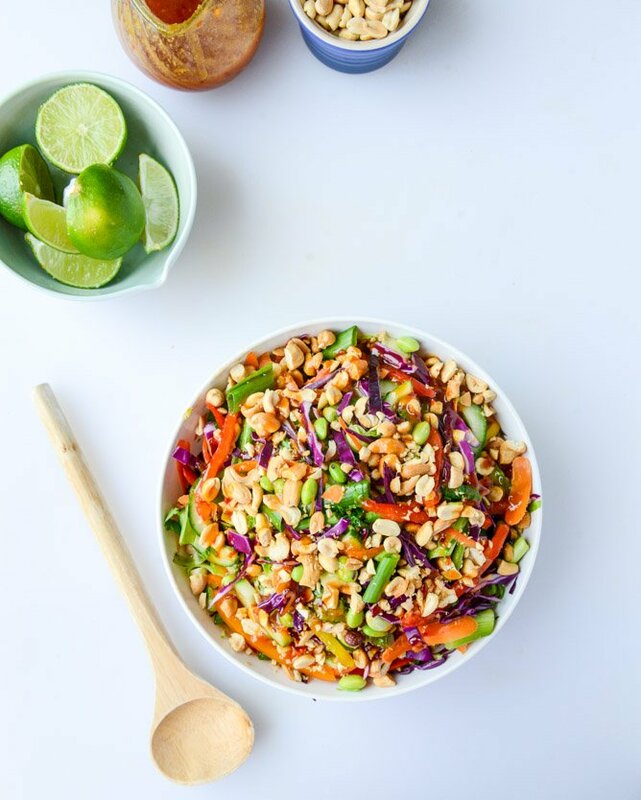 The chili lime dressings sounds so refreshing and good, I love all the flavors and veggies in this salad, the peanuts are such a nice addition too. very nice! This came up as a “related link” when I clicked the link to your post from Facebook this morning and it just seemed so you that I had to share. This is my dream salad. 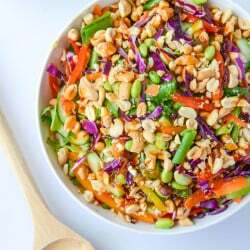 Brussels sprouts (my favorite veg) as the star in a delicious Asian-inspired salad? I could eat this straight from the bowl. Another recipe I can’t wait to try! HOLY Gorgeous — it’s so much easier to eat green stuff when it looks pretty!! I totally feel ya on the “no raw Brussels sprouts thing” – my favorite bagged salad mix includes big chunks of raw Brussels sprouts – I most def pick them all out before adding dressing. Bitterrr. Pumpkin carving definitely needs to involve beer cheese dip. I may have to make that a household tradition here too. I eat veggies kicking and screaming, but a salad like this not only makes them look appetizing, but sound AMAZING too. This is fantastic! Gorgeous bowl, Jessica. I can never have enough brussels sprouts! Omg I love this. I’m in love with anything Thai and full of texture and using brussels sprouts is genius! Definitely making this this weekend. This is the most gorgeous salad evvver, makes me want to ‘taste the rainbow’ lol! Serioulsy gorgeous. I hardly find recipes that I am running to the kitchen to make. But this is it! So much colour!!! This is one giant bowl of amazing. This is the kind of recipe that everyone enjoys at a potluck!! It is probably not ideal to visit your site when I have an empty stomach. My stomach is growling and punching my insides right now- this looks so amazing. AH! I want some brussel sprouts in my mouth. D Y I N G here – I freaking LOVE that salad from a couple years ago, but I love this even more! Honestly this is the only thing that I’ve been excited about for the past week or so food-wise, which I think you know is a big deal to a pregnant lady. YAY! Hey those vegetables look like a stocking!! Is it Christmas yet?! Haha. I loooove your Thai chicken salad, this is a great rendition! This sounds so amazing! you have to love a gigantic plate full of spicy, tangy, crunchy veg. I also feel you re big chunks of carrot — we’ve been shredding them for salads for ages, and it’s so much better! 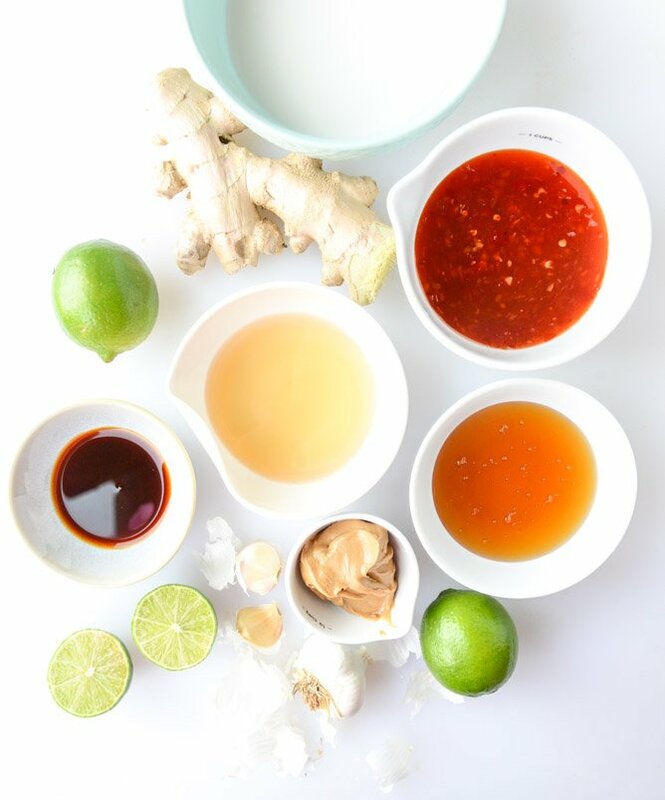 This looks awesome Jessica – I love the colours and coconut milk in the dressing – yes please! I discovered brussels spouts not too long ago and I love it. I really can’t wait to give this thai crunch brussels sprouts. It has all my favorite ingredients. And the colors! I just love the colors! OKAY. Delicious! I can’t wait to make this. I’m always staring at my B. sprouts wondering what I’m going to do with them next. 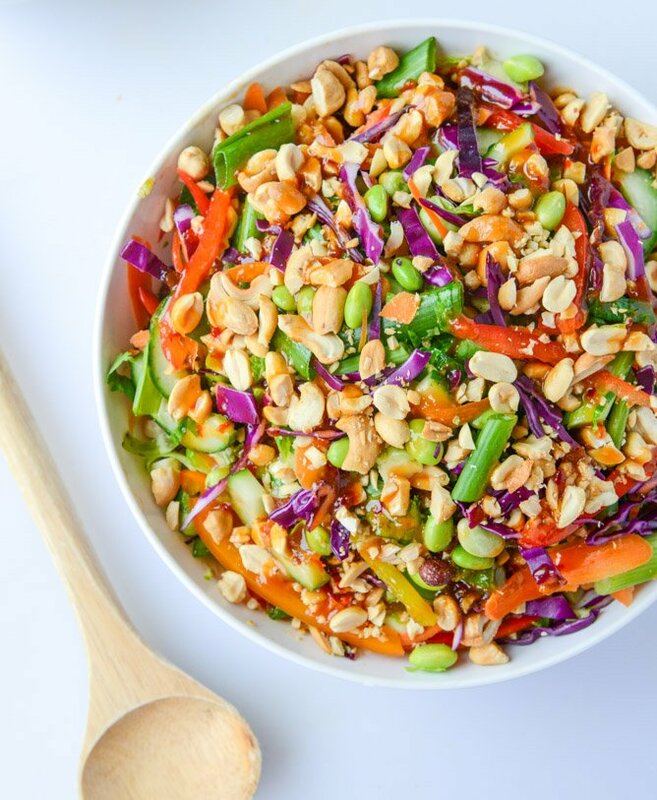 I love this fresh and tasty Asian spin on brussels sprouts salad! Wow…I could eat this salad every single day! This salad looks unreal!! I love that it’s made with brussels sprouts. Whenever I need a brussels sprouts recipe. I will keep in mind to go to your blog. This looks amazing and I’m so happy there is no meat or chicken in it!! I love the CPK thai crunch salad but always have to order it chicken-less. Can’t wait to make it! I just found your site and I love it!! Pingback: The Weekend Dish: 11/8/2014 : Best of Baking with Pinterest! I really want to make this salad for a Thanksgiving side dish. Would you recommend any other “dressing” to put over it? Wow, the pictures are great! :) You really got me in the mood to try out this salad. Is it also good if I use almond instead of peanut?